Another spooky date? Another ringing of the San Jose landmark's bell. HOW THINGS ARE DONE: Traditions? All too often in our go-go-go world they seem to fall by the wayside. Oh, a place or a group of people will start one up only to forget about it when the next year or special date rolls around. And then you have the Winchester Mystery House, a place that is very much about the past and how things were done when the mistress of the house, one Sarah Winchester, ruled her expansive roost. Ms. Winchester, it is no shocker, had a bit of a sweet spot for the number 13. The most repeated bit of 13-related lore about the San Jose mansion is probably the fact that there are 13 bathrooms in the place. Like any of our houses, right? We jest. That's a whole lot of bathroom action, and such the odd number, too. Again, tradition. So when Friday the 13th rolls around, the staff at the Winchester likes to mark the eerie occasion, as they will again on July 13. 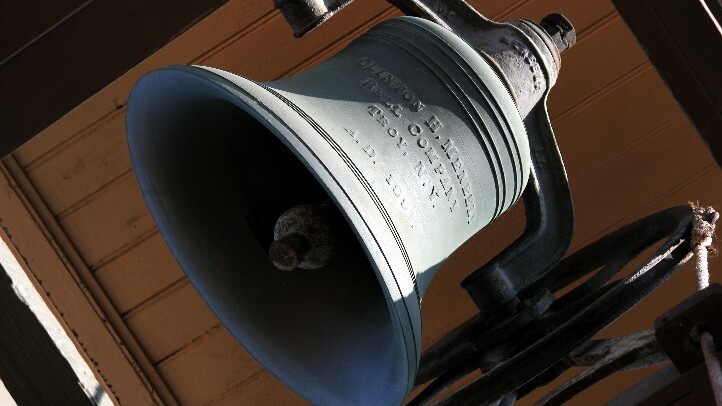 THE RINGING OF THE BELL: The on-the-grounds knell-maker will sound 13 times at 13:00 -- or 1 p.m., that is. As always, the attraction invites a few guests to stop by and do the honors. Demitrius Omphroy, a MS spokesperson, motivational speaker, and professional soccer player, will be joined by the firemen of San Jose Station #10 at the bell stand. We should note that the special Flashlight Tour for Friday the 13th is sold out but they'll soon start up again in time for the Halloween season. True, it is always kind of Halloween-y at a certain mansion, but, come October, the spirits rule.